When we’re struggling in a relationship or nursing the wounds from a painful breakup, there are three words that can keep us stuck or propel us forward. We can choose to use them as a stick to beat ourselves up with or we can see them through a softer, more compassionate lens and use them to help us evolve into a better version of ourselves. It’s written into almost all of our marriage vows: the promise in marriage that we will be together forever and that forever means until we die. So, of course, every single one of us goes into marriage with the belief that it will – and it should – last forever. And that anything less than forever (as we know it) is unacceptable. I hear many of my clients initially diminish themselves using the “F” word when they talk about their marriage: It was supposed to be forever. Forever, back in the year 1900, was 48 for women, while the average age to marry was almost 22. The life expectancy in 2010 was 81 for women, but the age to marry was 26. So, for women, the age to marry only increased by 4 years in 110 years, but the life expectancy increased by 33 years. So, possibly we can lighten up a bit on the idea and steadfast definition of forever. Possibly we can see that as our definition of forever grows, our ability to stay, grow, and evolve as individuals might need to evolve as well. Breakups are difficult. Heartbreak is painful. 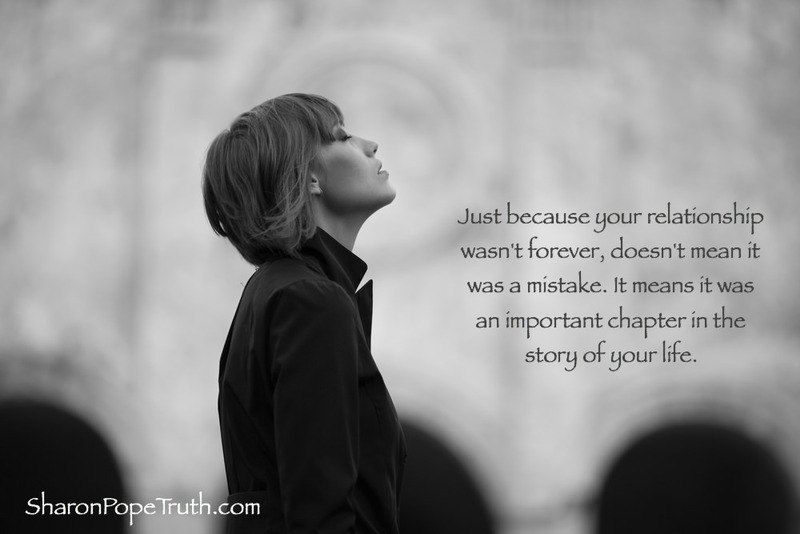 But just because a relationship fails doesn’t mean the relationship was a (here comes the other “F” word……) failure. There is no such thing as the F word (failure) in any relationship because every relationship gives us a gift or lesson that we didn’t have previously. The people we love – those we share pieces of our hearts with – are simultaneously our greatest challenges and our greatest spiritual teachers. Unlike traditional teachers who impart wisdom, our closest relationships expose all the parts of us we don’t really want to own in order to teach us about forgiveness and acceptance, to bring to light our beliefs about our ability to love and be loved. Forgiveness is not admitting defeat, showing weakness, or saying that what happened was okay. It also isn’t admitting that what happened is our fault or that it didn’t matter. Forgiveness is hard; that’s the truth. But there’s no way around it if we want freedom from the pain associated with this relationship. Holding onto past resentments keeps us from being able to move on with our lives in a healthy way. Past resentments are like a heavy weight that we carry with us that makes our journey slower and much more difficult than it needs to be. We can choose to put that weight down anytime we want.